Several years ago American Tire Distribution who has over 80 distribution centers in North America were looking for a way to keep down the dust in their facilities. Not only were the floors dirty but they also had lots of dust on their product as well as dust being in the air that was a safety concern for the employees. Tomcat rider floor scrubbers were the perfect solution. The cylindrical scrub system that sweeps and scrubs at the same time along with the side brooms that allows them to sweep and scrub along the racking and the edges allows them to take care of their dust problem. Initially they purchased a couple of Tomcat 350 rider scrubbers to see if it was going to solve their problem. Since then they have purchased dozens of Tomcat rider scrubbers, some of the rider scrubber models include the Tomcat 350, 290, 250, GTX and XR rider scrubbers. 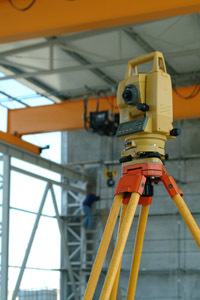 They continue to be very satisfied with the performance and ease of use. They have noticed a significant reduction in dust and have found their customers and employees more satisfied with their new level of cleanliness. 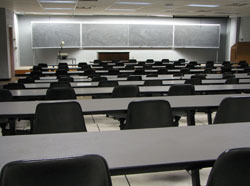 A major school system in the Atlanta area has been using a large competitors' cleaning equipment for years. They have hundreds of different walk behind and rider floor scrubbers as well as walk behind burnishers. The school system needed to cut back on labor expenses due to budget issues. They felt like it was taking too much time to burnish some of their large schools with their walk behind floor burnishers. They decided to test the Tomcat 255xl rider burnisher and a same size pad rider burnisher. It didn't take them long to find out that the Tomcat 255xl rider burnisher out performed the challengers' rider burnisher by quite a bit. They also found that they almost got double the run time on the Tomcat 255 than they did with the other burnisher. They were able to save enough labor by running the Tomcat 255 rider burnisher that the janitor had extra time to perform other tasks that he previously had not the time to do. A contractor from Atlanta was getting tired of their equipment constantly breaking down, specifically their walk behind scrubbers. They had several pieces of equipment but most of the fleet was walk behind scrubbers. They would scrub several stores a night, taking their scrubbers on and off of trailers several times. Being frustrated, the owner began his search for the most industrial piece of cleaning equipment he could find. When he looked at the Tomcat Minimag walk behind scrubber, he was very impressed with the accessibility of everything if he needed to replace parts. The overall ruggedness and durability of the Tomcat Minimag scrubber convinced him to purchase one for his guys to try. Almost 2 years later, he is perhaps one of Tomcat's biggest fans and would not consider purchasing any other floor scrubber other than that of Tomcat. Tomcat's cleaning equipment has been able to help him cut his costs in repair bills considerably. Their customers have been much more satisfied, since they can count on a Tomcat floor scrubber that will be cleaning their floor every night and not a competitor machine that is in the shop with costly repairs. Just last month a local movie theater purchased a Tomcat Model 200-UHS walk behind battery burnisher instead of a propane burnisher powered with a 17HP motor to clean 15,000 square feet of waxed VCT. The customer was initially concerned if the Tomcat battery burnisher would be unable to match the polishing performance of the propane burnisher. Through independent testing we performed with a major retailer using a gloss meter on waxed vct tile, we could assure the customer that the Tomcat battery burnisher would meet or exceed the performance of the propane burnisher. The customer was also concerned about the loads of maintenance required for the propane burnisher and also where to store the numerous propane tanks needed to keep the unit running. We discussed the multiple service issues surrounding the ownership of a propane burnisher and possible emissions concerns in the confined air space inside his movie theater each time the propane burnisher was used to clean the waxed tile. Emissions are not a problem on the Tomcat Model 200 battery powered burnisher and its dust collection is excellent, also discussed was how little maintenance there is with the Tomcat battery burnisher in comparison to any propane burnisher. 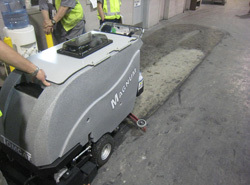 In the end, the customer ordered a Tomcat Model 200-UHS battery powered walk behind burnisher to clean his waxed floors and was very impressed with the rugged design of the commercial machine compared to the competing dealers' battery powered walk behind burnishers that were demonstrated. One of Wisconsin's premiere Indoor/outdoor water parks and family activity centers has a 100,000 square foot indoor sports facility covered in artificial turf. They had contacted us to see if our sweepers could clean the turf, as their current two rider sweepers were not doing a satisfactory job. Their sweepers were leaving behind much of the small fuzz, string, and wrappers. Operators also complained that it required 2 Rider Sweepers to clean the floor in an acceptable time. We showed them the mid-sized Tomcat 4700 rider sweeper. As hoped, the Tomcat 4700 battery sweeper performed flawlessly, picking up everything off the turf in one full speed path. 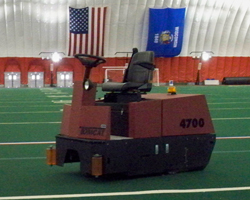 Some key points the customer was looking for in a rider sweeper that the Tomcat 4700 sweeper achieved was, durability, performance, ability to modify the machine to accommodate soft turf flooring, and superior run time. Sometime after the success of the Tomcat 4700 Rider sweeper at this Resort, they had contacted us again for an area they were having trouble cleaning. Their indoor water park deck surface was not getting as clean as they would like. 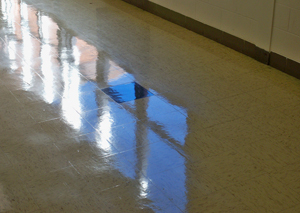 Their current machine, a 32" Cylindrical battery scrubber, was lacking the down pressure and squeegee pickup required to clean textured and stained concrete. The Tomcat Magnum 27 cylindrical automatic scrubber with our scrubbing brushes was the only machine that was able to scrub the floor in one pass. What the customer liked over their current scrubbers was, Superior scrubbing, Simplicity and heavy build construction, ease of cleaning the machine, one pass results, and a Dry floor, which reduces the potential of slips and falls in the water park. Roughly five years ago I was introduced to the janitorial staff at one of Ohio's premier Sports Arenas, on the campus of a major University. The janitorial staff had been using commercial walk behind scrubbers and an inexpensive rider scrubber with not much of a fan following. Recent demonstrations on new alternative rider scrubbers had left their engineers less than impressed with the commercial floor scrubbers available and their construction. That all changed when the Tomcat riding floor scrubber came to demonstrate its industrial build quality which was more than the engineers and floor crew had expected in this commercial environment. 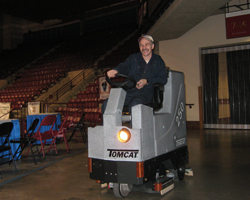 At the end of the trials the Tomcat GTX automatic scrubber was purchased and thousands of hours later it is still the preferred scrubber for the janitorial staff. Six months after the initial GTX riding scrubber was delivered from Tomcat, we were once again given an opportunity to compete against some larger Propane Sweeper/Scrubber. Even though the Tomcat riding floor scrubber didn't have an internal combustion engine, the industrial build quality and the maneuverability of this battery scrubber once again won the favor of the janitorial staff. 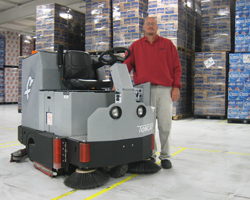 Tomcat commercial equipment was awarded the business with its ruggedly built floor scrubber for thousands less than the bulky and higher priced competitors' scrubbers. The combination of a more maneuverable floor machine for less money and a much smaller carbon footprint made the Tomcat riding floor scrubber was a better solution to the customers' floor cleaning needs. The janitorial staff at the Sports Arena has only a few hours in some cases to clean their large public events center between different acts, having reliable and efficient battery powered floor scrubbers is at the top of the priority list. They trust the Tomcat line of commercial cleaning equipment with their reputation, and others should too. No crying over spilt beer. A large beer distributor located in the heart of Ohio recently took ownership of a Tomcat XR riding scrubber to replace their older riding scrubber. They are a fast paced and high volume beverage distributor and the prior rider scrubber was down for repairs too frequently. The beer distributor needed a high volume and productive floor scrubber to quickly clean their 85,000 square foot facility. The 68 gallon tanks on the Tomcat XR cylindrical scrubber coupled with a 40" cleaning path looked like true value to the beverage distributor, especially given the ability to sweep and scrub in a single pass. Adding on-board soap with a Green certification only added to the Tomcat auto scrubber's value as a safe, effective, and efficient floor cleaning machine. 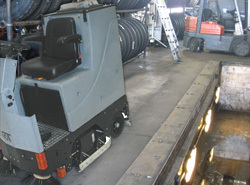 The Tomcat XR riding cylindrical floor scrubber has been serving in this particular beer distributor for quite a while now helping to scrub their facility in record time, clean black tire marks left by the forklifts, and safely deliver floor cleaning chemicals without risk to the operator. Even though this globally recognized beer distributor has a national agreement with another brand, they saw better value by purchasing The Tomcat XR cylindrical scrubber. 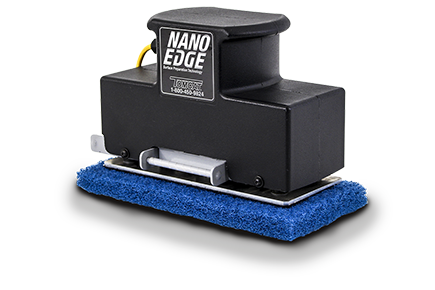 A national grocery retailer recently made the switch to the Tomcat line of floor scrubbers, choosing our battery scrubbers over the auto scrubbers offered by all other major. 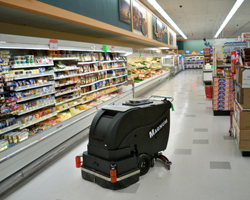 This specialty grocery store chain chose Tomcat walk behind auto scrubbers due to value added options and specifications built in to their American Made Tomcat MiniMag 26" disk walk behind scrubber. The open and accessible recovery tank, over sized motors, manager lockout keys, solid tires and overall rugged construction of the Tomcat battery scrubbers outperformed the competitors in the commercial cleaning equipment market. A year into the program and the top management is amazed at the lack of scrubber related service issues when compared to the scrubbers they'd previously bought. Replacement parts, ordering, shipment and service calls have all been streamlined for the grocer by switching to Tomcat Commercial Cleaning Equipment with a centralized process. With less than half of the grocery stores owning a new Tomcat auto scrubber, the customer's savings will continue to grow as the older scrubbers are traded in.